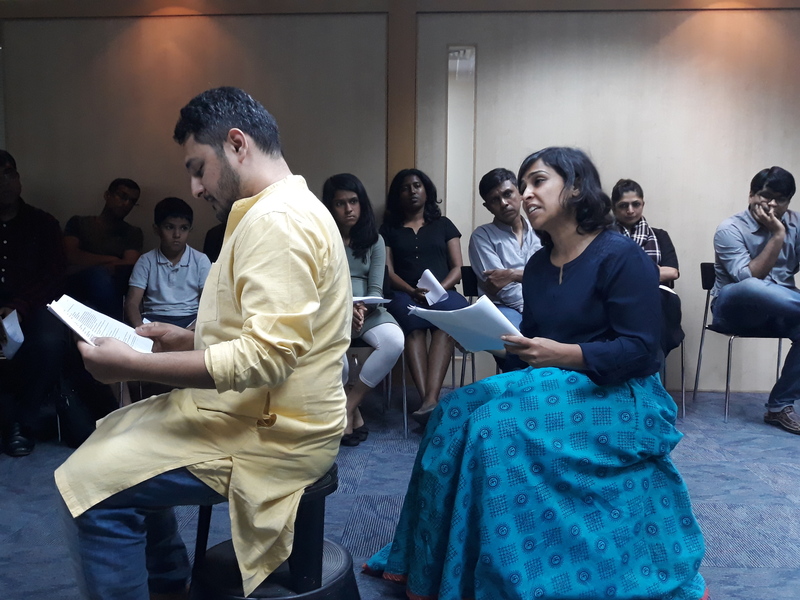 On the 30th of June, The Indian Ensemble in association with the British Council held an excerpt reading-discussion session, the eleventh of its series of Exploring Exciting Texts. The texts in close look were Mahasweta Devi’s Bayen and The Playwright is Dead by Deepika Arwind. This specific work by Deepika- a writer, playwright and theatre artist was nominated for The Hindu Playwright Award in 2017. The reading was under the direction of Mayura Baweja. The two texts had women as their central characters; Chandidasi Gangadasi who is the protagonist of Bayen or ‘the witch’ is shown to be immensely strong and vocal of her emotions of fury and agony. In The Playwright is Dead, the protagonist is trying to grip herself writing in the field of Play/Drama; here she is subject to mansplaining and prejudices. The discussion succeeding the play reading was based on the presence or rather the limited number of women prominently known in the field of plays and theatrics. Vijay Ashok Sharma, one of the performers, spoke about the research he put into this aspect and it brought out the misogynist approach prominent in this field as well. He mentioned how Brander Matthews, a writer who played a role in establishing theatre studies in formal education curriculum, put forward statements on why there are very few women playwrights. “The fact that women are likely to have only a definitely limited knowledge of life and the fact that they are also likely to be more or less deficient in the faculty of construction”, he quoted Matthews to have stated as reasons for this. Sharma then shared an observation of how the producers in theatre field would choose a male centered play over a female one, simply keeping in mind viewership and profit. One among the artists opined that the method of approach needs to be changed, which is possible through the form like humour or statistical surveys and the use of social media for publicizing upcoming playwrights and performers. The discussion reeled into why a conscious effort is being made to reach out and make this sort of a conversation possible. Hannah Gadsby’s Nanette came up as a reference to the modern day parable for people taking this effort and listening to women’s stories. The discussion went on to become more of a learning experience; one among the audience said how he realised how he should never become the image of a patronizing male. Towards the end of the session, Deepika mentioned how certain spaces allowed for these sorts of conversations to be possible. In ‘The playwright is Dead’, the tone of sarcasm runs deep to put across the concept of the how a woman playwright is positioned in the male-dominated world of theatrics. The play essentially points out to certain aspects like how Google offers a link to a list of women playwrights who cannot be ‘ignored’, and research pointing to how women writers, playwrights are more prone to mental illnesses. “Earlier if women were chastised for writing at all in the first place, today there are different constraints like familial pressure and other such matters” she added. Deepika Arwind is also the director-performer-writer of the play No rest in the Kingdom; the play deals with the concept of everyday misogyny. “This is not the kind of misogyny that can pass off as casual” she says on observing how the concept of masculinity takes up unnaturally large amounts of spaces in an everyday basis. In the play this is portrayed as comical and dark, in its totality. In conversation with Medha Agrawal, a theatre performer, she says that in her experience, if one needed to have conversations on gender in the theatre field, it was possible only with women or homosexual men, simply because the rest of the men don’t care enough to talk about these aspects. She is also part of Sandbox Collective, a creative services organisation that curates and produces performances. When asked if she has experienced some sort of prejudice in the field, she answered in affirmative. “When it comes to the technical aspects in theatrics, the men seem to think of it as some power-position issue. When I or some other woman talks about the lighting or sound that needs to be adjusted according to the requirement, the experience I have had is that the men give me surprised glances, followed by choosing to ignore me completely”. Atleast this is what she has experienced in India. “When we held a tour programme in Singapore, the entire technical aspect was handled by a woman. This can also be due to the fact that abroad, the theatres are provided with infrastructure that facilitates any individual to handle it by oneself; the bars that are required for setting up the lighting and sound are in place and one doesn’t have to look around for help. So it could be also because of factors like these” she said, leaving one to ponder upon what could be the reasons why male prejudice perpetuates in the field, just like in almost every other field.